I’ve just come in from enjoying the sun to enjoy a cup of tea and a couple of custard creams so thought I’d take this opportunity to share with you some of the purchases I’ve made over the last couple of days. I know when I’ve been watching haul vlogs on YouTube that the vlogger always says ‘this is in no way bragging about what I’ve bought’ and I just want to re-iterate that I am in now way bragging, just sharing with you what I’ve bought and the talking about the fashion on the high-street at the moment. On Saturday I went to Whiteley and the first shop I went to was Next. I find that the quality of Next can change from store to store (this is the case with any shop actually!) and I love the one in Whiteley so I knew I would want to buy everything I saw. I only ended up purchasing one item (I was tempted to purchase some shoes!) 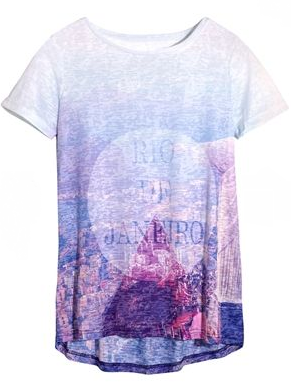 which was a soft purple printed burnout tshirt which has a faded picture of the Rio De Janeiro skyline. The picture’s below because I just realised I was wearing it when I took the picture on the banner! I was on the quest to find some casual tees as I have a lack of them so thought this was perfect and will go with jeans, shorts and leggings. The next place I went to was H&M. H&M can be extremely hit and miss, but there was quite a lot of really nice stuff in there. I bought three things, one of which was a bright pink lip gloss which I have yet to try. The other two were a salmon pink chiffon shirt and a silver chain necklace. The chiffon shirt jumped out at me and looked so springy and colourful, so I instantly took a shining to it. I also didn’t notice until earlier that it’s slightly fitted so it will be a better shape than other chiffon shirts I’ve worn which can look a bit sack-like. I’m looking forward to wearing this casually or dressed up with dark wash jeans and heels. As well as needing to purchase more casual tees, I was also on a mission to purchase some more necklaces. This silver chain will go with most of the clothes in my wardrobe and will probably become quite a staple as it’s a little more understated than some of the larger statement jewellery I’ve bought lately. So, I then went on to Topshop which I was really disappointed by. In terms of clothes, there wasn’t anything that I wanted buy, so I headed for the jewellery rack where I picked up a gorgeous gold stretch metal choker. Again, this will probably become another wardrobe staple that I can wear everyday. The style of the necklace allows it to sit flat on the skin instead of moving around ans twisting. So accept for buying my lunch, that’s all I bought in Whiteley, so I went over to Matalan this morning. I wasn’t expecting to purchase much, but I actually bought quite a few items. The first thing I picked up was a spring green shift dress. I am in love with shift dresses at the moment. You can wear them with jellies, converse, cute pumps or heels – so versatile. When I saw this I knew I had to have it. Unlike other shift dresses that I have, this one has a slight dipped hem which gives it a bit of edge. It also has a statement zip at the back to add a bit of detail. I can’t wait to wear it. I then picked up a silky pale pink top which can be worn dresses down with jeans or dressed up with a pair of black cigarette trousers and heels. The colour is adorable and is typical of the spring colours on the high street at the moment. I also bought a two-piece; sports luxe printed shorts and a matching strap top. Two pieces are everywhere and I’ve never been brave enough to wear them. So when I saw this set, I thought it’s an easy way to try and keep up with the trend. The pattern is black and white chevron (chevron is also really on trend at the moment) which I feel can be really flattering as well. Fingers crossed the sun will stay out long enough for me to wear this combo! The last thing I bought was a plain pale lilac burnout tee, for casual wear with jeans or sweats at home. They do it in quite a few colours so I may go back and get some more. Ok, so that’s me, all shopped out, but if you want to purchase anything in my haul, be sure to visit the stores websites: next.com, hm.com, topshop.com, matalan.co.uk.